“Explain how you’re not in a bubble, a billionaire bubble,” Chuck Todd asks. Steyer makes a joke and goes on to talk about all the people he has met in his town halls. Todd doesn’t press Steyer any further. But the question hits on a key flaw for Steyer, a question that will continue to plague him: how can a billionaire say he really cares about American workers when he lives a luxurious lifestyle and campaigns against the industries that put food on their tables? We know that Tom Steyer lives in a “billionaire bubble” and doesn’t understand the needs of everyday families struggling to get by because his radical environmental policies would decimate the families most in need. During the midterms, Steyer spent over a hundred million dollars to influence the election, backing “green” ballot initiatives in multiple states that threaten to double monthly electric bills on hardworking families, a reckless policy that would hurt low-income families the most. Steyer might be able to afford to pay exorbitant prices, but not every family can. 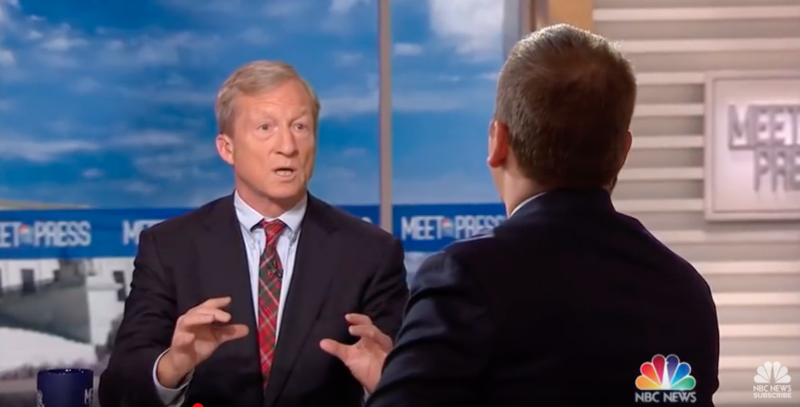 He might be able to dodge questions on Meet the Press, but we all know that Steyer lives in a “billionaire bubble” – the proof is in the harmful, extreme environmental policies he supports.